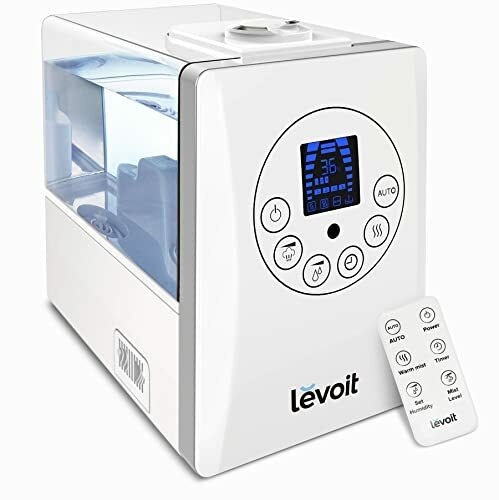 Levoit Warm and Cool Mist is an ultrasonic humidifier that comes with an intuitive control panel and a 6-liter tank. The control consists of a sensitive touchscreen and an easy to use remote that can work from as far as 5 meters. This unit has a whisper quiet operation as it produces less than 38dB to ensure that it does not disturb your sleep. Other features include an Auto Mode, Built-in Timer, and Customizable Humidity. It also has an Aroma diffuser for your favorite essential oils. 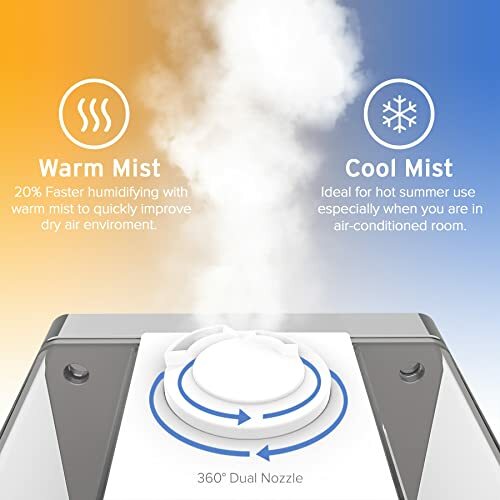 Warm and Cool Mist: This unit can dispense both warm and cool mist and hence making it the best humidifier for asthmatic﻿s and people suffering from congestion and coughs. It also produces either of the mists at three different levels. Tank Capacity: The 6-liter tank is one of the largest that you can get in these humidifier types. It gives the unit an ability to operate for up to 36 hours without a refill. This unit will also cover up to 280 square feet. Whisper Quiet: You will hardly hear any sound when this unit is in operation as it produces less than 38dB. The whisper-quiet operation means that it will gently disperse mist without affecting your sleep. Control: For the controls, it comes with a simple and easy to understand remote and a very sensitive touchscreen. The remote can work from as far as 5 meters. Auto-Mode: The Auto-mode will sense the humidity level in the room automatically and then trigger the dispersion of mist to get it to the level that you desire. Built-in Timer: This humidifier comes with a built-in timer that you can use to set the unit to run for 12 hours continuously. It shuts off once the time elapses and so you will never have to worry about forgetting to turn it off. Aroma Diffuser: It also includes an aroma diffuser that will make it possible to diffuse your favorite essential oils. It features both cool and warm mist at three different levels. This humidifier will tell you the exact amount of humidity in the room. Controlling it is very easy and convenient since it has both remote and a touch control panel. Levoit designs with an auto mode to adjust the humidity level in the room automatically. It has a large 6-liter tank that allows continuous operation for up to 36 hours. You will never have to agonize about leaks as it has a leak-proof design. This unit is whisper quiet, and it produces less than 36dB hence making it perfect for use in a baby’s room. It is easy to refill and clean. The display is quite bright at night, and so the light might interfere with some people's sleep. It is quite heavy when you fill it to capacity. The water tank is still not the best quality. The Levoit Warm and Cool Mist Ultrasonic Humidifier is one of the most convenient units to have at home. And this is not only because it produces both warm and cool mist but also because it is straightforward to use. It has a large tank capacity that can keep it running for one and a half days continuously which means you do not have to keep refilling. ​The remote and touchscreen controls are also beneficial, and most users will love them. And it is also easy to clean and refill so that you can enjoy a steady supply of humidified air with no worries. Even with the few concerns from some customers like the light being too bright at night, overall it is still a top-notch humidifier that is worth buying.